This is a superior, all over workout in Pittwater, Nature’s Paradise (see ‘ya sweaty gym equipment!) Targets core stomach muscles (no need to lie on your back doing crunches), defines your arms (bye, bye bat wings! ), tones & tightens derriere & legs (yes, really!) Learn water skills and paddling techniques. Increase your balance, strength, confidence and endurance. Latest research from Avalon Stand Up Paddle confirms that participation in our group stand up paddles causes playful laughter, confidence boosts and a complete disregard for negativity and all things toxic! Cost: $25 or $15 if you bring your own board. 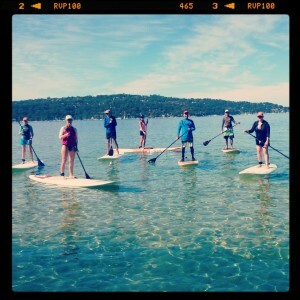 * A Stand Up Paddle lesson from Avalon Stand Up Paddle is the prerequisite for entry to Weekly Paddle Fit Groups. * 60 – 90min class duration. Call Tony on 0413 363 405 for more information. This entry was posted in Uncategorized on July 24, 2014 by David.